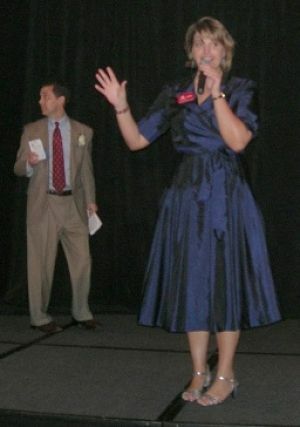 Virginia auctioneer Sherry Truhlar sells at a 550-person gala auction. When groups are looking for fundraising ideas, many add a silent auction to an existing event. I’ve heard of and seen silent auctions at all types of fundraisers and friend-raisers: dinners, fairs, golf outings, networking events, sorority meetings, and church functions. The silent auction is casually added to the mix of activities with the hopes that it will generate some needed funds. Make no mistake, your guests LOVE silent auctions! Many like them because they are hoping to take home “a deal.” They poke around the silent auction, seeing what’s available that they might pick up at a discount. Silent auctions are also popular because they are unobtrusive. Items are often quietly displayed on a table somewhere and are often (sadly) ignored until pick-up. That’s one of the advantages of a silent auction. Silent auctions will work at most events because they can be held in conjunction with other activities; they are quiet. Live auctions will not work at all events because they take up program time and are noisy. Some benefit auctioneers believe that a live auction can be incorporated into any event. I disagree. As a former event planner, I know that sometimes we just don’t want to squeeze any more into an event. Consequently, some of the galas my company works each year are silent auctions only. I wouldn’t recommend that those charities incorporate a live auction into their event unless they are prepared to make some programmatic changes. A live auction won’t work into the existing event set-up. But if you are thinking of adding a silent auction to an existing event because you’ve been told that you need to raise more money, here’s my advice. Look at your existing event. If there’s a way to add a live auction into your event, do that. Avoid adding a silent auction if you can instead incorporate a live auction. It will make you a lot MORE money for a lot LESS work. In 2004, one of my clients decided to add an auction to an established spring fundraiser. They were planning on incorporating a silent auction into the event, but changed their minds after one of the volunteers — a former vendor I worked with when I was an event planner at GE — suggested calling me. We held a live auction (no silent auction) at their carnival-esqu event. It went better than they hoped, earning almost 3X what had been projected. Four years later, this charity decided to incorporate an auction into their fall fundraiser. For the fall event, they decided to try a silent auction. After the event, they called me. So the following year (in 2009), we conducted two live auctions for this charity: one at the spring event and one at the fall event. The fall event, which was held during the deepest part of the recession, earned double the funds raised in their silent auction in 2008. That is the power of a well-crafted live auction. So although I personally love silent auctions, my advice for those focused on fundraising is to incorporate a live auction – if possible – into the gala. It will pay off for you in the end.